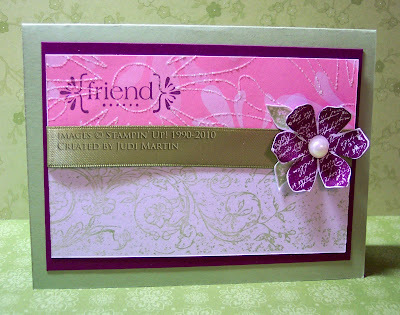 Judi Martin made this card with the Sending Love Specialty paper in the Occasions mini. I love the glitter in this design. The Rich Razzleberry flower and mat look wonderful against the Certainly Celery background. She used one of my favorite stamps sets, Vintage Vogue, and the coordinating jumbo wheel. Judi did a beautiful job on this card. I love the colors.